With all the coverage of Occupy Wall Street, I’m hearing a lot about urban space and how we live in it. When space arises as a site or source or critique, I always wonder about the ways DH could help analyze the spatial and make spatial thinking more available to humanities scholars, but it also makes me think about the spaces of academic work itself. I’ll leave the digital question until I have a little more technical skill to bring to it, and for now I’ll try to think through the space of collaboration. I want to do that through a story about another interesting experience of public space that seems just as relevant as the protests. I guess this is a “getting to know you” autobiographical blog post as well. I was recently in New Orleans for UVa’s fall break, and I participated in my first proper second line. My teacher and friend Joel Dinerstein is a member of the Prince of Wales Social Aid and Pleasure Club, and he proved a great tour guide for a surprised and amazed grad student who has been in prim and proper Charlottesville for too long. 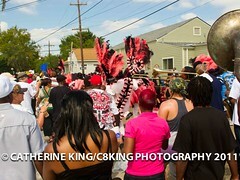 As Joel will tell you, a second line is no quaint neighborhood shindig; it instead involves dancing-walking-grooving through a winding 5 mile route that crosses racial and socioeconomic boundaries. When you’re with an American Studies mentor, it also involves waxing ethnographic about African American working class culture and marveling at how this experience can only be lived, never represented. Buying bottles of beer from people wheeling coolers through the street helps with both the dancing and the analyzing, and there’s barbecue on truckbed grills if you get hungry. I danced and clapped my way down Magazine St., stopped streetcars full of amazed tourists on St. Charles, and ducked into the Sandpiper Lounge for a beer. Around the corner on LaSalle St., the Dew Drop Inn sign remains across the street from where the iconic Magnolia projects have become a mixed-income housing development featuring cookie-cutter townhomes and treeless courtyards. This is central city, a neighborhood that white folks generally avoid and that few tourists know exists. I had driven through this area countless times before, but it’s a place you pass through on the way to somewhere else, not a destination or a place to linger. But last weekend I found myself buying lemon cake from The Pie Lady in the middle of Louisiana Avenue, meeting the King of the second line while we jostled toward the bar for a beer, and chatting with the hodgepodge of Tulane (my alma mater) English faculty, post-docs, and alumni who all came out for the afternoon. In New Orleans, roads don’t have medians; they have the neutral ground. There’s interesting geographic history to this term that work like Rich Campanella’s makes accessible, and just the name itself sheds some light on what makes this place so special. The Second Line made me slow down, made me stroll or dance through places I had never noticed as places. Dancing is a way to move through urban space that I had never quite thought about before. If you’re doing it right, it makes you more aware of your body even as you stop worrying about exactly what your body is doing, and it makes you more aware of the place where you are and where you’re going as you negotiate everything from potholes in the road to your previous abstract ideas about the space you’re in. It’s inspiring and it’s reparative—second lines derive from jazz funeral traditions that turn loss into celebration—and it’s making meaning out of music and dance. Now I understand the metaphor of a political “movement,” and I hadn’t even noticed that it was a metaphor before. 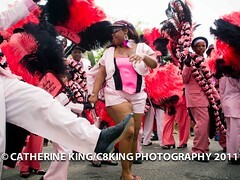 This second line brought people together who wouldn’t normally be together. Identity categories and the implicit rules that separate us are transgressed just like neighborhood boundaries and traffic laws, if only temporarily, and there was also me with all these Tulane English folks past and present. I was less self-conscious than I’ve ever been at a faculty-student social event; my “elevator story” wasn’t a source of tongue-tying anxiety, and I felt OK offering half-baked ideas about literature and culture and second lining. As I ate red beans and rice and sweet potato pie, I felt that we were all equal. This is something I rarely feel as a graduate student, and I’m sure that’s my fault as much as anyone’s, but it seems at least partially related to the spaces in which we live and work. In New Orleans, I felt a spirit of collaboration I didn’t know I had been looking for. But I think maybe you can’t actually look for it; it’s improvised, and that might be where some of the frustration of my previous blog posts came from. The planned Praxis collaboration seemed less organic that I would have hoped. But I’ve been inspired by recent serendipity and am looking forward to working with the Praxis team even more. I hope we can remember the “healthy dose of play” that we mention in our charter and make Praxis even more of a space of encouraging and productive boundary-crossing. On NPR’s Studio 360 this weekend, architecture critic Michael Kimmelman pointed to Aristotle’s Politics _for evidence of what’s exciting about Occupy Wall Street: “[Aristotle] talks about a _polis shaped by the distance of a herald’s cry — meaning a civic space, a city functioning in which people have the ability to meet face to face to speak with each other.” He goes on to point out how Zuccotti park has been transformed from a place people hurry through to a place where people linger and connect with one another. This seems to me like one of Occupy Wall Street’s most exciting accomplishments, but that’s just any Sunday afternoon in New Orleans. Cite this post: lindsay-o’connor. “In the Neutral Ground”. Published October 17, 2011. https://scholarslab.lib.virginia.edu/blog/in-the-neutral-ground/. Accessed on .